The cards that are known to hobbyists as 1939-40 O-Pee-Chee V301-1 Hockey are considered to be O-Pee-Chee cards even though there's no proof that the company actually printed them. They're also not technically cards but 5" x 7" premiums. 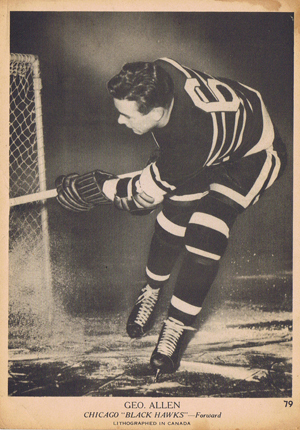 The fronts show a black-and-white player picture, sometimes showing the player in his a suit and not their uniform. Under the picture, a typed font identifies the player, team and position. A card number appears in the lower-right corner. 1939-40 O-Pee-Chee V301-1 Hockey backs are completely blank. While these cards are often lumped in with the pre-World War II era, it's often forgotten by those living south of the border that Canada entered the war in 1939. It was not after the attack on Pearl Harbor. So, the 1939-40 hockey season was the first to see players being drafted to serve in the military. The war had a big effect on the NHL, eventually reducing it what eventually became the Original Six teams. There are 100 premiums in the set. They were sold one at a time in cello packs. The use of premiums instead of cards was an idea often used during the Depression in the United States as costs outpaced sales. The practice was continued in Canada during the war. Many of the game's biggest stars appear in 1939-40 O-Pee-Chee V301-1 Hockey, including Eddie Shore, Turk Broda, Sid Abel and Charlie Conacher.